As recently as yesterday I retold the story of a professor of the University of Toronto who tried to discredit my research in early 20th century Central European comparative cultural history based on his view that since I was also a dancer, my research was irrelevant as dancers are "automatons who don't think for themselves, but simply do as they are told". I was shocked that in the 21st century I was coming up against this image of the unintelligent dancer. 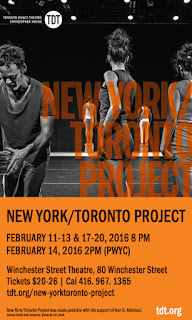 I guess because I so recently retold this story, I am gleefully posting yet another gloriously articulated interview with a fiercely individual, intelligent and rigorous dance artist: Jeanine Durning, the second choreographer involved in the New York/Toronto Project with Toronto Dance Theatre which opens tomorrow night, February 11th at 8pm, at the Winchester Street Theatre. 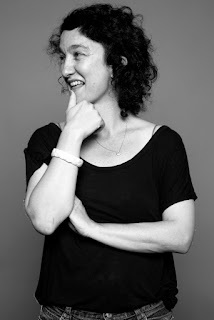 I am so grateful to Jeanine and Joanna (Kotze, whose interview on her portion of the New York/Toronto Project I posted earlier this week) for their terrifically honest and precise answers to my questions. Read on to learn about Jeanine Durning's work. LR: How did the TDT commission come about for you? JD: I'd met Christopher some years back through Deborah Hay. He'd seen me perform her work several times, I believe. And then a couple of years ago, Ame Henderson was creating a work with TDT called voyager, and she asked if I would be interested to come in on that process as an outside eye/advisor kind of person since she was working on a continuous movement practice with the company and she know I had been working on a practice of non stopping. 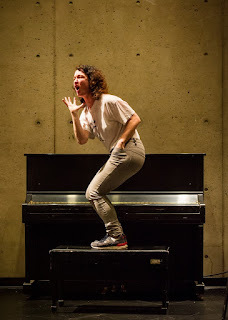 So, I came for a couple of weeks and I taught movement practice for the company and community, was there for rehearsals, and then at the end of that period I performed inging which is my nonstop speaking performance practice. I think Christopher was interested in continuing the dialogue that began through that process. I have enormous respect for Christopher and the work he does. And the company is very rare in that they are very willing and able to be in a mode of research and questioning. The whole structure of the company is in support of that way of working. I am also extremely happy to have this opportunity to share work on a program with Joanna whose integrity and intelligence is evident in everything she does. 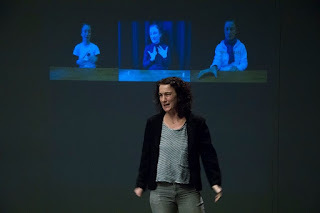 Jeanine Durning in inging, October 2014, Zagreb. photographer unknown. LR: Your practice of "nonstopping" — what was the impetus for building this practice? 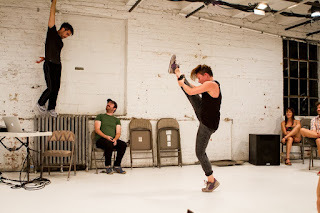 What do you think this practice offers dance artists and audiences? When I started what I am calling nonstopping now, I wasn't really framing it through that language. That language emerged through years of working on something, and through teaching it in different capacities, and trying to find a way to talk about it. As these things happen, language tends to reduce the expansion of things. 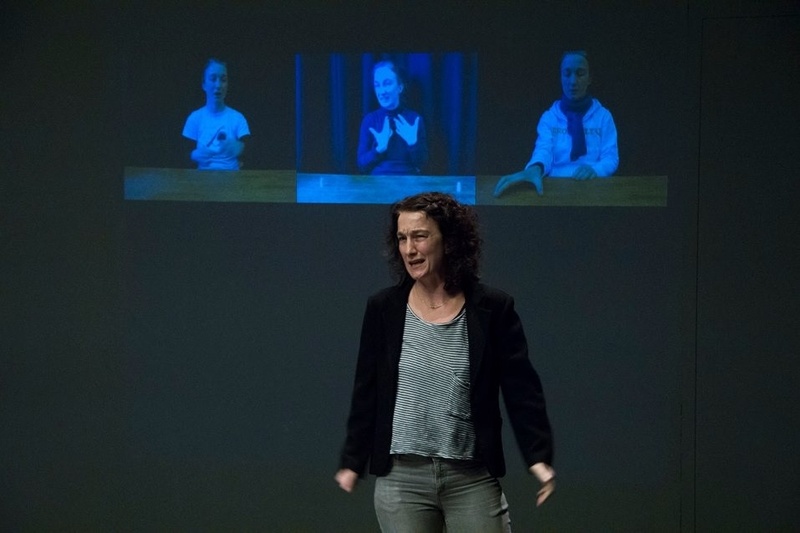 In any case, it came out of a time when I was personally questioning the relevance of performance, asking what it was, what could it be, what were we sharing, and what am I personally contributing by continuing to make work. I was going through a kind of artistic paralysis. I would enter the studio, and I didn't "know" what to do, and nothing I did seemed to "matter." One day, I decided that I would just come in to the studio, put everything down, and just start going, non stop, without agenda, without my feeling of desire, or feeling good about what I was doing, without an idea to fill in with dancing. I did that for a while and then created this cycle of nonstop moving, nonstop speaking, and nonstop writing. I would just go through this cycle over and over again. Through the "doing" of this, through this "purposeful purposelessness," I was discovering that the internal structures of my thinking are directly linked to how I speak, to how I move and organize space and time, and to how I construct language on the frame of a page. I started to become really interested in what constitutes choreographic thinking, and seeing that choreography is a way to reorganize our thinking through our attention to the tools of space and time, and not just about repeating aesthetic value systems, or narrativizing experience, or iterating an historicized relationship to the form of the body. So this is what, after about 7 years of working this way, I feel this way of working can offer both artists and audiences: a reflexive approach to their ways of thinking; a recalibration of patterns of thought and action; an alternative to outcome, form, and production; a ways and means of perceiving ourselves and each other in different ways than we expect to see them; a heightened awareness of our environment and how we enact ourselves within and through it; and ultimately a way of experiencing our togetherness as something that is precious, vulnerable, precarious, and fleeting. LR: You work outside a more conventional company model, working in a way that is specific to the individuals involved…..has this been the same approach to the TDT creation, even though the dancers function as a company themselves outside the scope of your work with them? JD: Well, I work outside of the conventional company model for very practical reasons but then that condition sets up a different kind of power structure. Things become much more horizontal. But principally my concerns are the same, no matter what the model. Generally, I've been interested lately (lately meaning the last 8-10 years!) in creating the conditions through which the performers can compose and be in a decision-making process in real-time. 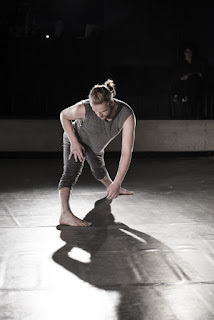 So, on some level, the choreographic structure that emerges is not separate from the performer's relationship to the tools and strategies I propose. One is naturally and critically dependent on the other. I am definitely not one of these choreographers who comes in with pre-determined materials, and has an idea of how to design that material in space and time. It's not a value judgement. It's just not my skill set. I'm more interested in seeing people trying to figure something out while performing, and I'm interested in what kind of body that "figuring out" produces. So say if someone becomes really "good" at something, then I try to figure out how to destabilize that knowing part of what they do. That is where the specific people involved help to create the conditions of the work. I can't separate the people from the work. It's not interesting to me nor do I think it's possible. LR: I love a question which you wrote in regards to your work “To Being”: “What does it take to stay in action?” I wonder how this question translates or might be answered in the context of keeping going as an artist? JD: The choice to continue to be an artist requires a specific relationship to being in the world, and that being in the world consequently filters into the work that is made. To Being asks of us, the performers: how do you keep going when you feel you can't, how can you keep giving when you feel you are incapable of it? The mechanism, the operation of the work demands that, in spite of those questions, or maybe because of them, you must find a way to keep going, and in the midst of that, what you are practicing is humility, generosity, vulnerability, precarity. It's a different relationship to or understanding of what skill is, or what expertise is, or virtuosity, or purpose even. And ethically, philosophically, politically, these, to me, are qualities worthy of practicing. As John Cage said: "Inspiration is not a special occasion." Or as Chuck Close said: "Inspiration is for amateurs. The rest of us just show up and get to work." For me these days, inspiration and creativity are by-products and not the thing itself. 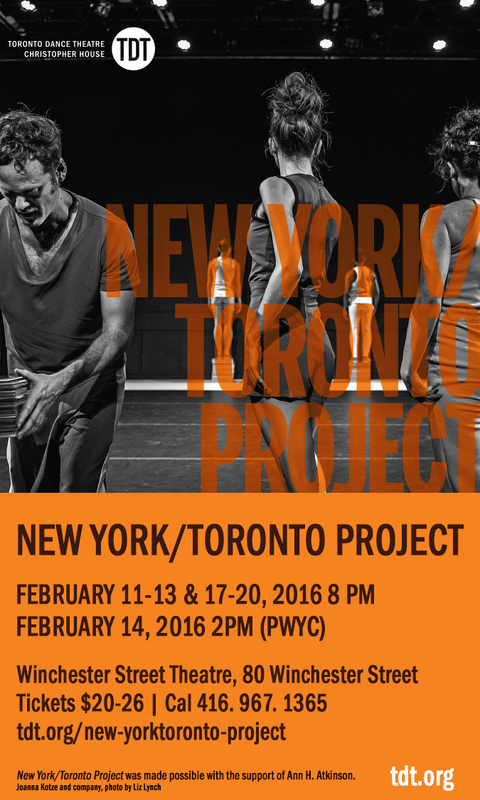 LR: What have you learned or discovered during this process with Toronto Dance Theatre? JD: I've been working for the past years on a creating operations or mechanisms, or following a primary directive, and then just going. And then the research and practice becomes about collecting and discovering tools and strategies to help the sustainability of that operation in real - time, over time, and under different conditions. This way of working understands a structure that emerges through the materials, rather than the other way around. For the work with TDT, because of the amount of time we had, it seemed important to do the inverse and establish a structure right away and then understand how the materials we were working with are informed by that structure. This way of working produces a different relationship to space and how we understand time, because you are working with repetition of structure and the memory of that structure. I also learned and continue to learn that language and how you frame things/ideas/propositions through language changes the perception of that thing, and therefore the doing of that thing. And I discovered that this company, the staff, the manager, the rehearsal assistant, the production manager, the artistic director, everyone, is amazing and really about supporting the research of the body as dance. I also learned that I am officially in love with all the dancers I'm working with! all photos courtesy of Jeanine Durning. Thanks Jeanine! !